Social media can truly save the day for stray dogs. 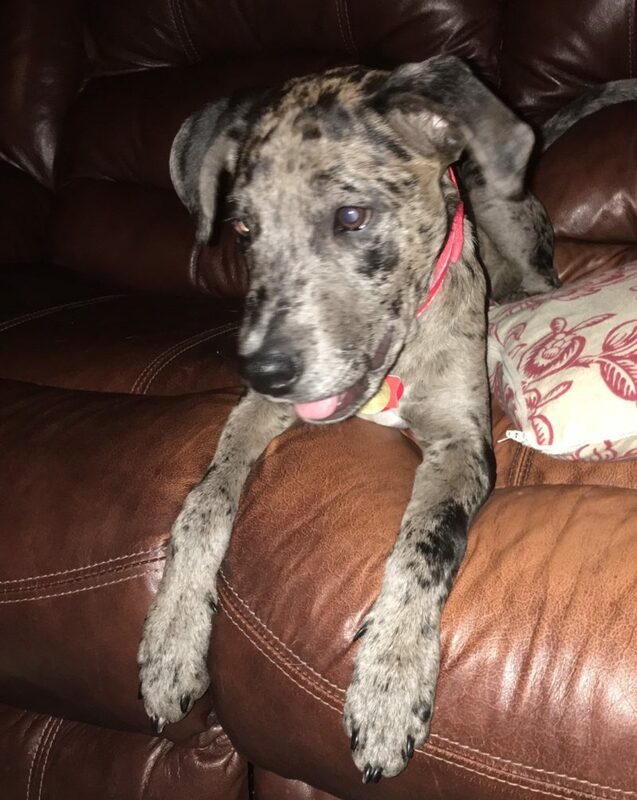 This is the story of how we adopted our second Catahoula Leopard Dog puppy from the county shelter. Our love for Buster began with a shelter video posted by volunteers to a Facebook page for the pound. A woman in the region then shared the video to a closed group on Facebook for Catahoula owners. That’s when my Saturday morning and life changed. I saw this trembling creature and knew we had to go spring him. Earlier this year, we lost our old Chester B. to ravages of cancer and his younger brother Higgins was despondent. We’d been conferring on the right time to get another dog and my boyfriend wanted to hold off. That is until he saw the compelling video of the shaky puppy at the pound. That prompted him to push back a meeting with a man about a dove lease. We later showed up for the hunting lease meeting at a Buccee’s with our new puppy wrapped in a towel from the shelter. The puppy was an estimated 4 weeks old and weighed 5 pounds, but we were guessing a lot of that initial weight was from worms! His little body was terribly distended from worms. This displaced his center of gravity so when he tried to walk forward, he ended up knocking his forehead on the ground. By Sunday morning, our concerns grew for his health. To put it delicately, there was an environmental disaster in his crate. Live worms came out of poor puppy. This was after his first dewormer dose. Without getting into further revolting details, we made sure his go time was in the front yard and not in the backyard where Higgins plays. Buster was discomforted and even looked a little scared. I could not wait for our Monday morning appointment with our regular vet. Dr. O. set the puppy on the right track with another kind of dewormer, an antibiotic for a skin condition, other medication and well wishes for the addition to the family. The vet also estimated Buster was actually six weeks old and would likely reach 50-60 pounds when full grown. Just looking at his paws, we wonder if this is a low estimate for his adult size. Sometimes when he stretches after a nap, he appears taller. He has been growing like a weed, gotten healthy and begun his life of adventures, starting with the backyard. He has learned leash walking, sit, stay and lay down. He previously obeyed fetch, or “bring it,” but now relies on his own discretion with that command. We will seek to reinforce “bring it,” especially as we want to take him bird hunting. Before we do that, a lot more training steps and phases are in order. He is now a little over four months old and weighs closer to 30 pounds. He is thriving. He’s also eating my shoes and clothes. The good news: he has stopped gnawing on my hands. He’s learning to bay and starting to boss around Higgins, our four-year-old Catahoula/Foxhound mix. This is the second time social media saved the day for dogs at our home. A lost mother-daughter yellow lab pair showed up and their family saw my post on a lost & found page. We have had several dogs turn up here and the previous owners said there is something about this house that draws them in — maybe because they just like it here. Buster and Higgins, our pound puppies, love it here. Moral of the story: Adopt a shelter dog. There is so much love at the pound!